HomeAnother Win for Rowena Zahn! 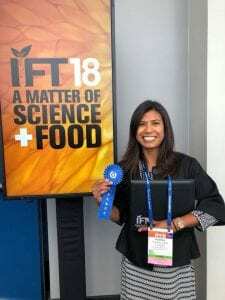 Rowena Zahn took first place in the Aquatic Food Products Division Graduate Poster Competition at IFT 2018 in Chicago. She presented her research on the optimization of DNA-based methods for the detection of elasmobranch species in shark cartilage pills. Way to go, Rowena!